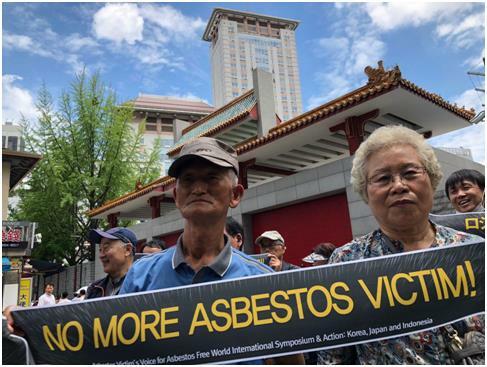 SEOUL, July 3 (Yonhap) -- The Ban Asbestos Network Korea (BANK), a South Korean civic group, held rallies in front of the Russian, Kazakh and Chinese embassies in Seoul on Tuesday, calling on the three countries to stop production of asbestos, which is classified as a substance that causes cancer. BANK, which is composed of the Citizen's Center for Environment and Health and other environment-related civic activist groups, said it sponsored the protest gatherings on the occasion of its 10th anniversary. During the rallies, BANK held a news conference and delivered a letter to each of the three embassies, asking for their cooperation in halting the mining of the known human carcinogen. In the letter, the network said, "As of 2015, global asbestos mining reached 1.36 million tons. Russia accounted for 51 percent of the volume, followed by Brazil with 19 percent, China with 16 percent and Kazakhstan with 14 percent." "Brazil last year decided to ban the use of asbestos. But China, Russia and Kazakhstan still produce asbestos for exports to foreign countries," it argued.